Coconut macaroons are so easy to make and needs very few ingredients. All you need is just 15 minutes to make these elegant coconut macaroons. They are extremely delicious and irresistible. They are chewy and moist on the inside, lightly crispy on the outside and has a wonderfully sweet coconut flavor. As these coconut macaroons keep well for days, they make a perfect Christmas gift. Those who do not have much time on hand, can bake these delicious coconut macaroons for Christmas. I am sure coconut lovers will love these macaroons a lot. Today let us learn how to make coconut macaroons following this easy recipe with step wise pictures. Line a baking tray with parchment paper and keep it ready. If you do not have parchment paper, grease the baking tray with little butter and dust it with flour. Powder the granulated white sugar and keep it aside. Preheat oven to 180 degrees C for 10 minutes. Add powdered sugar and salt to the egg mixture. Add vanilla extract and mix well until combined with a wire whisk or a fork. Add desiccated coconut and mix well. Drop the mixture by 1/2 a tablespoonful, one inch apart on the parchment-lined baking sheet. Bake at 180 degree C (bottom coil - 15-20 mins and finally top coil for just 1 or 2 minutes to give a nice brown shade on the top) for 15-20 minutes or until golden brown. After 10 minutes of baking, rotate the tray and continue to bake until done. This is done so that the macaroons will get baked evenly. Remove from the oven and cool for 10 minutes. Then place it on a wire rack to cool. They taste excellent when warm from the oven. Note - If you are using sweetened desiccated coconut flakes, reduce the amount of granulated sugar to 1/4 cup. For Eggless version - Mix 1/2 cup condensed milk with 1 1/2 cup of desiccated coconut and 1/2 tsp vanilla essence until well combined. Now the egg less coconut macaroon mixture is ready. Bake as mentioned above. Storage and Shelf life - Store it in an air tight container at room temperature. Stays good for 4-5 days at room temperature and for several days in the refrigerator. Hi padhu...is there any alternate for egg.. While baking you have mentioned "interchange tray".. do you mean we should rotate the tray after 10 minutes? 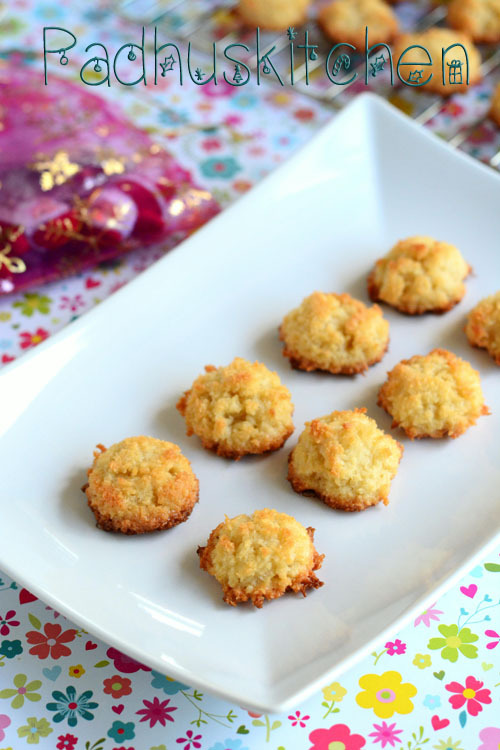 Have been looking for coconut macaroons recipe.. happy to find it in your blog ! I am sorry. You have to rotate it after 10 minutes. Priya, Bhargavi -you can use condensed milk. I have updated the egg less version under "notes"
can these be made with fresh coconut? may be dry roast a bit and then make them ? Dry coconut is preferable. If you dry roast fresh coconut and use it, you have to consume on the same day. I live in Chennai. Where do you get parchment paper? I tried in many super markets but in vain. Jasmin - There are many shops which sell baking accessories in Waltax road, near Central station. You can try there. So few ingredients and so simple to make yet DELICIOUS ! Thank you for sharing this recipe !!! How to make it fully crispy? It will not be crispy inside because of the coconut we are adding. I made a big batch to distribute to her school teachers. Hey it's so watery how can it be a thick dough like u showed in the pic? Once you add desiccated coconut, the mixture will become thick. Use medium sized eggs. Can't we make it without oven? ?